Halloween The Movie At Halloween Horror Nights!!! That’s right, Boils and Ghouls, your favorite boogeyman is back! 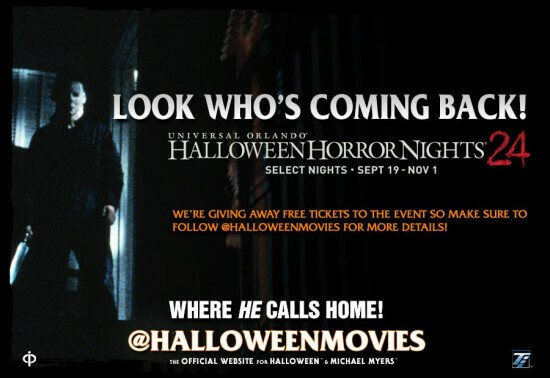 Michael Myers will be making an appearance at HHN in Orlando, this year. Myers originally appeared in 2009 at HHN Hollywood, in a house called: The Life and Crimes of Michael Myers, which covered most iconic scenes from the original films, and even a nod or two to Halloween 3. Fans of the series have been waiting for this appearance of their favorite killer, in their favorite Halloween event on the East Coast, and now they have it! The original film, which was made on a shoestring budget of $350,000 in 1978, went on to gross over $70 million at the box office. It was one of the first films to employ a Steadicam system, and was known for creating audience “empathy” with the killer by giving a first-person POV to the opening murder. It also defined classic Halloween trappings and customs for a generation, by creating a brooding, atmospheric tone which captured the spirit of the holiday. The film is beautifully shot by Dean Cundey who would go on to shoot Romancing The Stone, the Back to the Future trilogy, and Jurassic Park, and is directed by Master of Terror, John Carpenter, who gave us Escape From New York and The Thing. But the most iconic reach of the movie is not the amazing featureless mask that was created out of a Don Post Captain Kirk. It is the music. 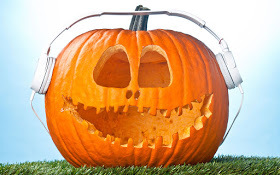 To kids that grew up in the 80’s, that music is Halloween. It is as iconic as the Star Wars or Jaws theme, and just as influential. The idea that this pulsing, off-beat theme is going to pump through Universal Studios Florida is enough to make my heart palpate with giddy, galloping skips. This is one of my favorite all-time films, and I am so excited, I might not be able to contain myself. I hadn’t planned on going to Orlando, this fall, but I have been scouring travel websites, all damn day! Here is a small taste of what the original 2009 Hollywood house was like. If this is any indication, we are in for one heck of a treat.